These DIY Dollar Tree Funnel Set Christmas Trees, turned out so cute! My favorite part? They only cost about $3.50 each to make! Hi friends, how have you been? The Christmas crafts are in full-swing around here! Last weekned, I paid a trip to the Dollar Tree to look for some cute add-ons/ supplies for a few of the holiday crafts that I'm working on. I was disappointed when I couldn't find any cone foam forms in their floral section. I have a bunch of stockpiled ribbon, and I had my heart set on making ribbon trees to display on the tops of my kitchen cabinets for Christmas. Though I had a plan, I certainly didn't want to shell out $5-$8 for each of the cone foam forms from the craft store, to make my ribbon trees. After perusing the aisles, my eyes landed on a 3 piece funnel set in the cooking section. Each set comes with a small, medium, and large funnel (just $1 for each set of 3). After stacking them on top of each other, I decided that I could easily use the funnel sets, in place of a cone foam form, to make my ribbon Christmas Trees. Now that they're complete, I actually think they turned out better than they would have, had I used foam forms. The funnels are wider, which gives a much fuller look than the narrow foam forms would have. 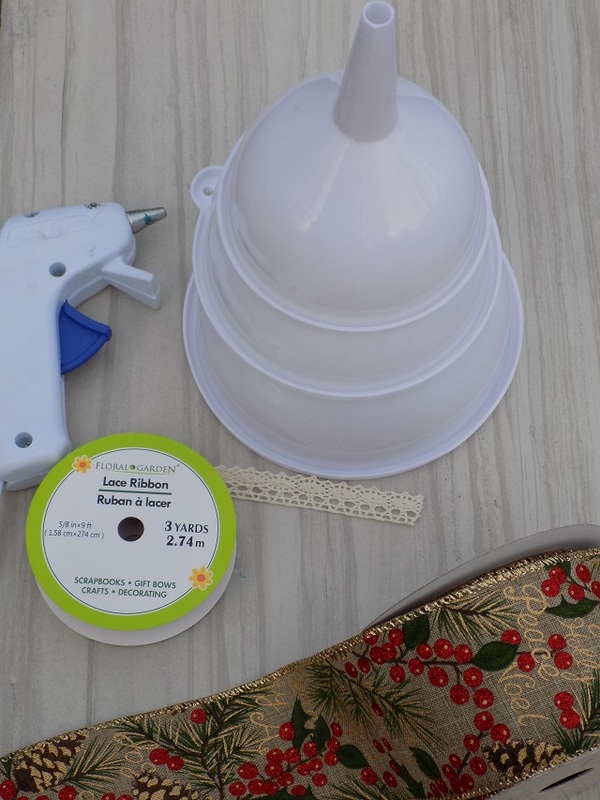 While I'm using my Dollar Tree Funnel Set Christmas Trees as a display on the tops of my kitchen cabinets, they would also make a super cute DIY holiday gift idea, this holiday season! 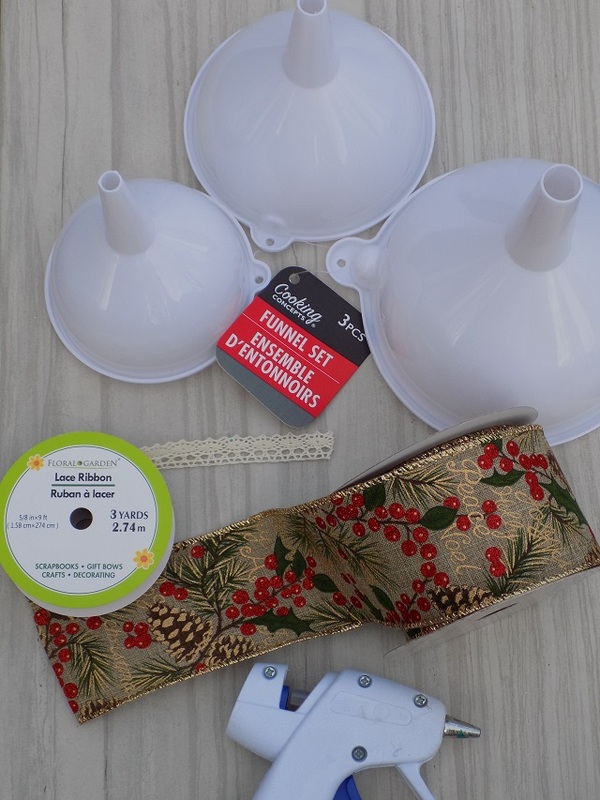 Read on for the full supply list, and my simple tutorial to make your own Dollar Tree Funnel Set Christmas Trees. Use the largest funnel in the set as a base. Add a few generous dots of hot glue to the inside of the medium funnel. Press the medium funnel (staked onto the medium size funnel) lightly to secure/affix the medium funnel on top for the large funnel. Repeat this step to secure the smallest funnel in the set, on top of the medium funnel. 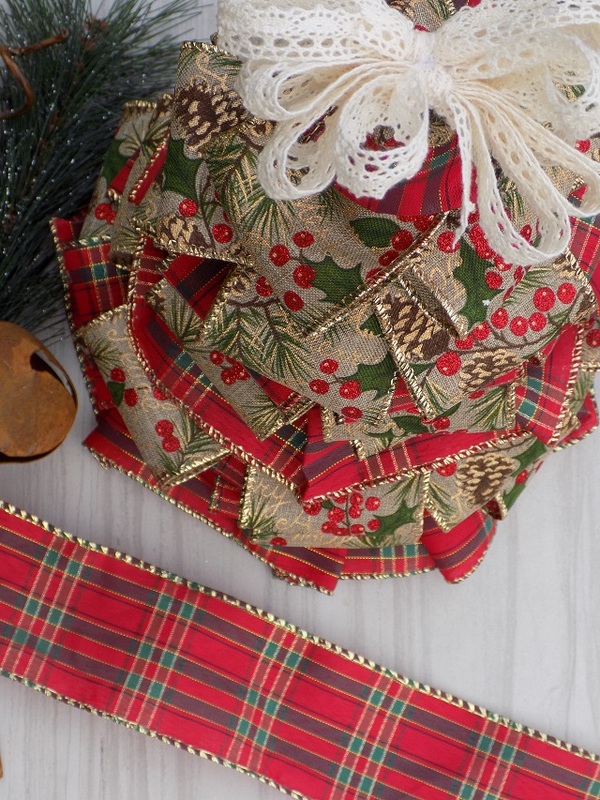 Once your funnels have been glued to create your Christmas Tree form, Cut a 18" piece of ribbon. Secure one end of the ribbon to the bottom/base funnel with a dot of hot glue. Pinch/bunch the ribbon every 2"-3" to create a ruffle effect. Secure every 2"-3" to the large/base funnel with a large dab of hot glue ( making sure to cover the bottom/edge completely. For the next layer of your ribbon tree, cut 6-8 3" strips of ribbon (depending on the size/width of ribbon that you're using). Fold one end of each of your cut ribbon strips (print / color side out) in -meeting/joining both ends of the ribbon with a small dab of hot glue to create a ribbon loop. Glue each of your ribbon loops as the next "layer" on your ribbon tree. Repeat this step, until you've covered the large funnel completely. When you get to the edge of the medium funnel, repeat step 2 to cover the edge of the medium funnel. Once complete, repeat steps 3-5 until the medium funnel / layer is covered/complete. When you get to the edge of the small funnel, repeat step 2 to to cover the edge of the small funnel. Once complete repeat steps 3-5 until the small funnel/layer is covered/complete. 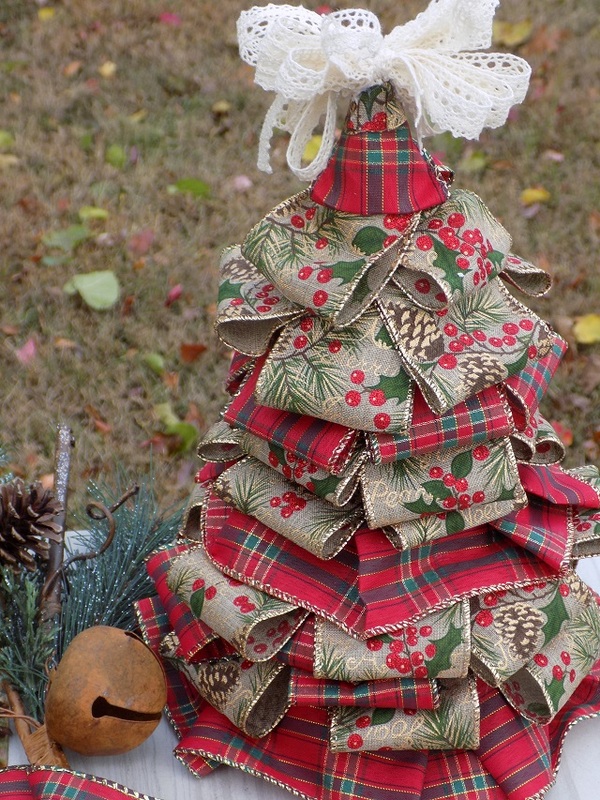 Make /add a ribbon / lace bow to the top of your completed DIY Dollar Tree Funnel Set Christmas Tree, to complete the pictured look. 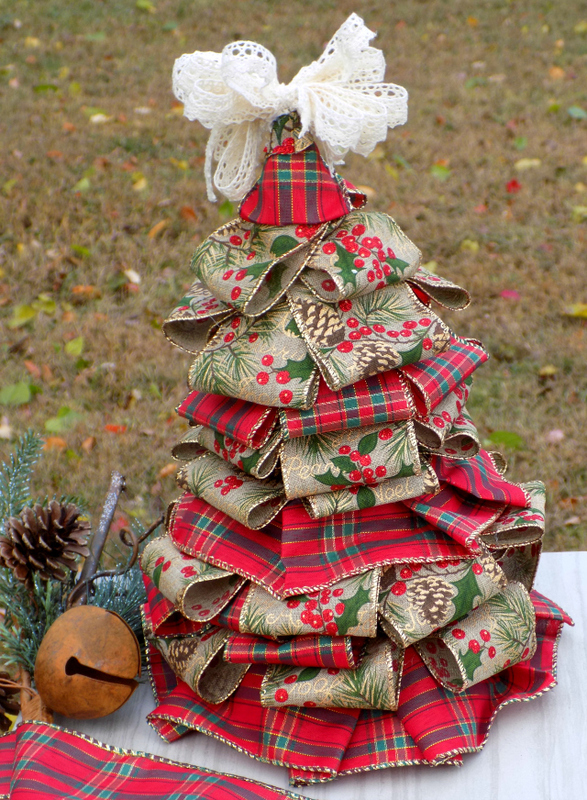 Display and enjoy, or gift your DIY Dollar Tree Funnel Set Christmas Trees to someone special. Happy crafting & Happy Holidays, friends! This is such a beautiful Holiday tree that you made. You did such a good job and I like the pretty colors and how original it looks! Love all these projects!! Easy and fun that the kids can help with! Each year the kids make gifts for their grandparents. These are great ideas! I love these Funnel Set Christmas Trees!! These are so pretty! I love how inexpensive they are to make and would be a fun craft for the kids to make. This is such a pretty decoration. I like the items come from the dollar store to make it. I love how rustic this turned out, it is so pretty and you could personalize it with the ribbon, and no one would know its funnels. Well now these are cute and I already have ribbon. Now all I need is a funnel set. This is a really awesome craft for Christmas.